"This book is a hoot and a half! The story is multi-layered, funny, socially relevant, and engrossing. The wonderfully fanciful cast of characters would be right at home living in Toontown. EVE explores unique and interesting themes. Many years from now, I believe EVE will take its rightful place in the library of modern science fiction classics." 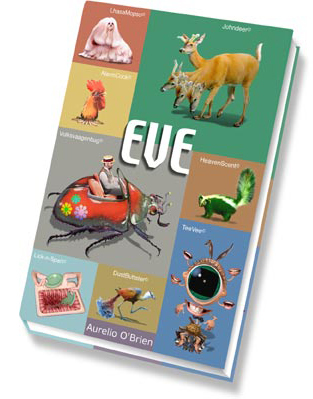 In his debut novel, EVE, Aureio O'Brien transports us to a future where technology has been replaced by biology in the form of genetically engineered CreatureComforts™. 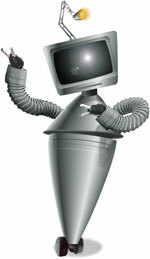 The last functioning robot, Pentser, offended by this turn of events, induces its lonely human owner, Govil, a genetic designer for GenieCorp™, into secretly creating a deliberately average woman, Eve. This act violates every law of their new age. EVE is Aurelio O'Briens's vivdly original, sharp, sweet, and satirical tale of Govil's adventure. Part Swift, part Shelley, and a little bit Shaw, EVE takes place in a future both stunning and silly, beautiful and earthy, and fully grounded in the obscure psychology of human desire. "What O'Brien does for his futuristic vision is certainly unique, and the most fun I've had in a long time." "This is thought provoking, original science fiction. You'll never look at genetic modification the same way again." "The creativity that's evident everywhere in O'Brien's hilarious satire of consumer culture makes it a terrific read." "It has plenty of 'through the looking-glass' winces & chuckles, & is thought provoking too!"